This entry was posted on Wednesday, February 28th, 2018 at 12:15 pm	and is filed under Appetizers, Cooking with Kids, Vegetables. You can follow any responses to this entry through the RSS 2.0 feed. You can leave a response, or trackback from your own site. This is a welcome post! 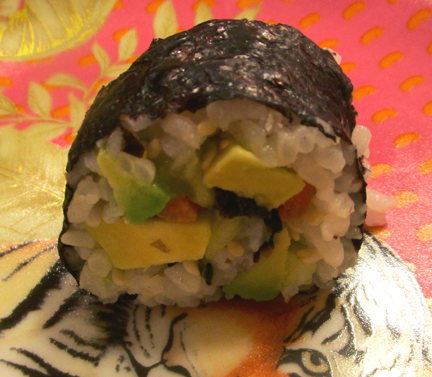 As exotic as sushi once seemed (in this country at least), you’ve made it accessible and appealing. 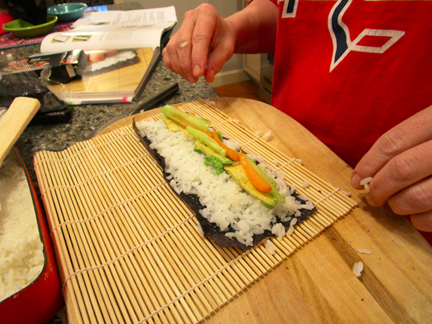 That it’s healthy as well only adds to the likelihood that readers will rise to the challenge and attempt their own sushi rolling. 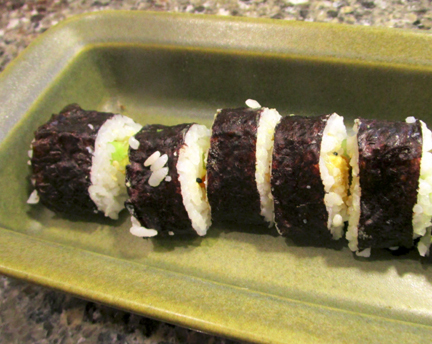 Now all we need is for nori to become as ubiquitous in grocery stores as flour and corn tortillas are. Do I see a rhubarb, rice and mint roll on the horizon? I love sushi!! That looks good. I would love to make some!! Thanks to all for the comments. Peter, alas no rhubarb sushi yet, but I will keep it in mind. 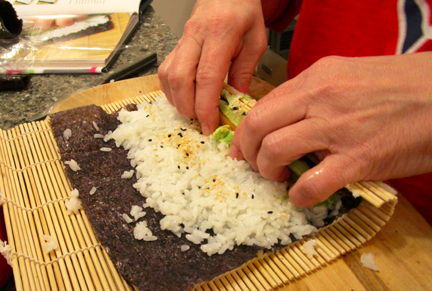 Julie, I find that the other foods obscure the nori–but it can be strong, at least in smell. We couldn’t get our cats away from it; they were fascinated by the seafood smell. Love this recipe! Gonna try it. Looks beautiful and delicious. My new Korean friends use fish – but it is cooked or smoked. They don’t like raw fish. Enjoy, Penny. And Pat, I happen to have smoked salmon IN THE HOUSE!